SEQUOIA NATIONAL PARK – Sequoia and Kings Canyon National Parks resumed regular operations yesterday, Tuesday, Jan. 29, following a temporary deal to end the 35-day shutdown of the federal government. All areas of the parks that are typically open this time of year, continue to be open. Employees started to come back to work last weekend. Entrance stations began collecting entrance fees, and all visitor centers reopened for winter season hours of operation on Jan. 29. This allowed park staff to test out systems and also reconnect with colleagues they hadn’t seen in over a month. Azalea campground in Kings Canyon National Park continues to be open without reservations, as is typical this time of year. Potwisha campground in Sequoia National Park also continues to be open, and will resume reservations starting Jan. 30. Recreation.gov is operational and available to those looking to make campground reservations for the coming months. Please call 559-565-3341 for current road conditions and weather. For trip planning, visitor center hours of operation, winter safety information, and more, visit www.nps.gov/seki. For campground reservations visit www.recreation.gov. 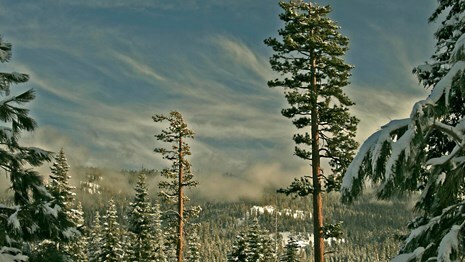 For Sequoia Parks Conservancy program schedules and reservations visit www.sequoiaparksconservancy.org. For lodging, markets, and restaurant information visit www.visitsequoia.com. Visitor centers reopened for weekend operations on Jan. 19 thanks to a donation from the Sequoia Parks Conservancy (SPC), the official park partner of the parks that covers National Park Service (NPS) interpretive rangers and facility maintenance at all locations. The donation also set aside money for the reopening of Pear Lake Winter Hut, also managed by SPC. These two parks, which lie side by side in the southern Sierra Nevada in Central California, preserve prime examples of nature’s size, beauty, and diversity. Over 2 million visitors from across the U.S. and the world visit these parks to see the world’s largest trees (by volume), grand mountains, rugged foothills, deep canyons, vast caverns, the highest point in the lower 48 states, and more. Learn more at www.nps.gov/seki or 559-565-3341.